The AWARD ceremony on the first day of the exhibition provides a platform for finalists and winners, which is equally valued by exhibitors and decision makers of the international solar industry. The Intersolar AWARD winners enjoy great exposure, which emphasizes their pioneering role in the market. In the year of the 10th prestigious Intersolar AWARD the panel will, for the first time, present an award for projects in Smart Renewable Energy, which is part of the category for Outstanding Solar Projects created in 2016. This award puts the spotlight on projects, which promote the energy transition while creating a link between energy generation, storage, grid integration and energy management. The Outstanding Solar Projects category once again focuses on innovative projects. New business models in hitherto untapped areas hold great economic potential. This goes for innovations in the areas of installation as well as for new approaches in the areas of marketing and invoicing. The submissions reflect the wide range of possible customized solutions: Floating photovoltaic installations in Portugal, sustainable neighborhoods in Dubai, roof-mounted photovoltaic systems on train carriages in India, facade installations and direct marketing in Germany, cooled milk containers in Kenya, and PV panels in South African greenhouses. The selection of finalists reflects the importance of solar installations far beyond the generation of electricity. These projects are able to support entire regions in their everyday lives. For example, a closed cold chain for long-life milk produced in small dairies in Kenya has been made possible thanks to a combination of a photovoltaic system and special components. Furthermore, new PV installation variants are now suitable for previously unused surfaces, such as facades. This allows solar power to be generated even in areas that lack large surface areas. In the Photovoltaics category, the range of technical and organizational innovations continues to expand. Submissions include modules, inverters, substructures, module production technologies, as well as electrical components. Software and services for the sales and operation of PV installations are gaining in importance. Manufacturers and suppliers can now use economies of scale and market growth to considerably reduce costs. Furthermore, component manufacturers are improving their production processes, using more efficient materials, and providing easy-to-install designs. The panel of judges has therefore selected solutions for lightweight installations, concepts for the utilization of water surfaces, as well as for optimizing the management of large-scale open spaces in the megawatt range. The shortlist also includes a solution for connecting PV battery systems, which allows individual components to be connected, creating swarm solutions. This enables the automation of processes and thus reduces costs. Other emerging trends include cloud solutions and the optimization of self consumption. Installations can be monitored and controlled in real time through the cloud. Plant operators can use the cloud to sell or give away surplus solar electricity, or to market it in another way. This new way of achieving profitability also has an effect on consumers’ own production. When a lot of electricity is produced, it can be advantageous to add additional consumers to ensure the flexible usage of the surplus electricity. 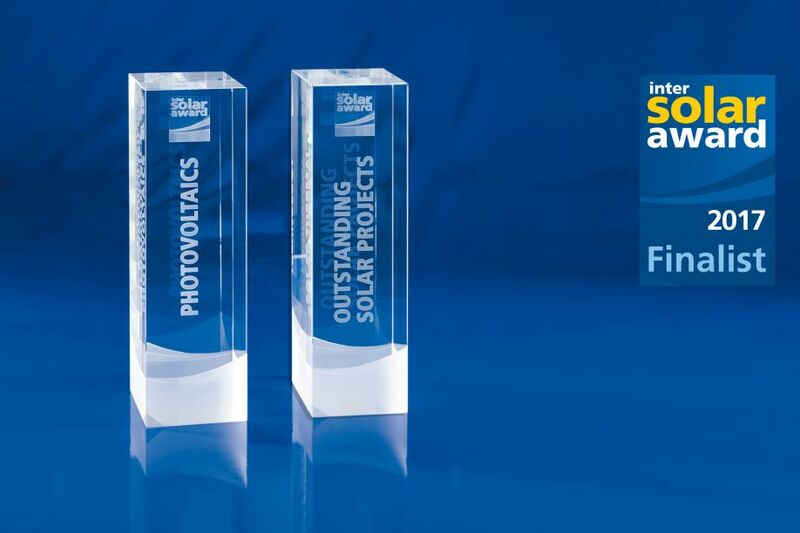 The winners of the Intersolar AWARD will be announced on May 31 at Intersolar Europe, together with the winners of the ees AWARD. ees Europe, the continent’s largest exhibition for batteries and energy storage systems, is taking place in parallel to Intersolar Europe. Prior to the awards ceremony the finalists will be available to answer visitors’ questions at the Innovation and Application Forum, where they will be giving short presentations about their submissions between 9:45am and 12:00pm, and again between 2:00pm and 4:00pm. The ceremony will kick off at 5:00pm, and will also take place at the Innovation and Application Forum (hall A4, booth A4.530). - a2-solar Advanced and Automotive Solar Systems GmbH (Germany) with the project “Solar glass facade for the new town hall in Freiburg”: Freiburg's new town hall has been equipped with 880 attractive glass solar modules. In this flagship project, photovoltaic modules make an important contribution to achieving the Zero Emission Building standard. - Ciel & Terre USA, Inc. (USA) with the project “World’s first hybrid FPV & hydroelectric system at the Alto Rabagão Dam”: This photovoltaic installation floats on a reservoir in Portugal, producing electricity while making the best possible use of space. As an additional benefit, the installation reduces the rate of evaporation. - City Solar Energy Systems Installation & Maintenance L.L.C. (Dubai) with the project “The sustainable city – Phase 1”: A sustainable city with over 500 townhouses and villas is being constructed in Dubai, designed to be a net zero energy city. PV installations with a total output of 7 MWp cover the power demand for the houses and e-mobility. The concept is rounded off with the complete recycling of water, urban farming and the use of sustainable building materials. - GOLDBECK Solar GmbH (Germany) with the project “Landfill Hellsiek”: A photovoltaic installation is being used to prevent rainwater from seeping into a landfill site in Germany The almost 10 MWp installation covers the landfill, which has the double advantage of reducing maintenance costs and generating electricity. - JA Solar Holdings Co., Ltd. (China) with the project “Solar distribution & generation in Mauritania (SDGM)”: Mauritania is a country where – until recently – solar energy has played only a minor role. This has changed with the construction of free-standing installations with a total output of 16.6 MW, which reliably supply eight remote settlements with electricity. - Jakson Engineers Limited (India) with the project “Commissioning roof-mounted solar PV systems on Indian Railways train carriages”: The company Indian Railways are retrofitting existing passenger coaches with roof-mounted photovoltaic systems. The generated electricity is used for operating the lighting and fans. This is a large-scale project covering an existing fleet of 50,000 carriages. - Manz CIGS Technology GmbH (Germany) with the project “New ZSW building”: The frame for the suspended rear-ventilated facades is designed to hold standard modules. The facade has been mounted on the new building of the Centre for Solar Energy and Hydrogen Research (ZSW) in Stuttgart. - Narok County Government (Kenya) with the project “Talek solar power minigrid”: Mini-grid photovoltaic systems supply domestic and commercial buildings in Kenya with electricity. An innovative payment method is available online. - Next Kraftwerke GmbH (Germany) with the project “Bridging the gap - A virtual power plant for constant power supply”: The virtual power plant supplies balancing power generated by photovoltaics, wind power and cogeneration systems in Germany. The business model, which includes the weather forecast and direct marketing, promises success now and for the future. - Phaesun GmbH – Hohenheim University (joint submission, Germany) with the project “Solar powered cooling for enhancing milk value chains”: Solar energy is the basis for a new business model serving small dairies in Kenya. Photovoltaics are combined with bespoke components, such as the cooled milk container, to create a closed cold chain for the transport of healthy, long-life milk. - RAM Pharma (Jordan) with the project “Solar process steam generation at RAM Pharma”: The Jordanian thermal power plant generates steam at over 160°C. Fresnel collectors use the steam to produce energy for pharmaceutical production processes. - Simpa Networks (India) with the project “Simpa's pay-as-you-go solar home system model”: The Indian business model is opening up new markets, encompassing financing, installation, remote monitoring, metering and even invoicing. This enables it to reliably supply renewable electricity. - Stadtwerke Heidelberg Umwelt GmbH (Germany) with the project “Smart energy revolution in apartment buildings”: The energy services provided by this German utility company allows tenants to buy affordable solar power. The innovative business model provides tenants with an overview of their electricity, water and heat consumption as a basis for climate protection. - SUNfarming GmbH (Germany) with the project “SUNfarming Food & energy training project”: Integrating photovoltaics in greenhouses has the potential to benefit food production around the world. This model project from South Africa shows how even difficult, arid regions can now be used for agricultural production. The glass-glass modules used in this project transmit a sufficient level of 15% of the light into the greenhouse. - Trojan Battery (Colombia) with the project “Trojan battery powered microgrid in Colombia”: Five micro-grids on Colombia's coast are supplying more than 400 households with electricity. The photovoltaic system has been designed for the inhospitable conditions of the jungle, and are supplemented with diesel generators. - Array Technologies, Inc. (USA): The DuraTrack HZ v3 Solar Tracker is a single-axis tracking system for large free-standing installations in the megawatt range, able to move 750 kWp per system. The optimized design reduces installation costs, keeps maintenance to a minimum and is extremely reliable. - Ciel & Terre International (France): HYDRE-LIO® is a system which allows large PV installations to be built on bodies of water. This allows the utilization of large surface areas on bodies of water, such as reservoirs, which previously have not been fully exploited, despite often being located close to electricity consumers. - DAS Energy GmbH (Austria): The semi-flexible plastic roof membrane EVALON® Solar cSi with integrated crystalline and solar cells and a high power density of around 1 kW peak per 10 m² of roof surface can be used universally. The low weight and glass fiber-reinforced design allow new applications to be implemented, particularly in the area of large commercial buildings (new buildings and roof renovations). - Enphase Energy (France): The Enphase Home Energy Solution is a solar system solution for domestic buildings which uses micro-inverters, high-efficiency lithium ion batteries, an energy management system and a web or mobile application. Expanding storage and PV is easy thanks to the modular design of the system. Additional components, such as a charging station in the garage for an electric vehicle, can be integrated into the system. - Hanwha Q Cells GmbH (Germany): Q.PEAK RSF L-G4.2 375 is a high-performance monocrystalline module with an optimized module cable connection and innovative module frames made of folded steel. The simplified substructure saves costs through the use of fewer components, decreased material consumption, and quick assembly. - Power-Blox (Switzerland): The small PV battery system is suitable for mini-grids and can be scaled up to any size for the Swarm technology & Power-Blox 200 series. The components can be stacked and plugged together to create a self-controlled and self-learning power supply in off-grid areas which can be connected to the standard 230 V consumer. - Premium Mounting Technologies GmbH & Co. KG (Germany): The PMT EVOlution South / East-West / 10° / 15° lightweight substructure system has been optimized for large-scale flat roofs. Tool-free mounting processes and the low number of components make for a quick and safe set-up. The structural safety is guaranteed by the general building approval of the aerodynamic system. - SMA Solar Technology AG (Germany): The efficient and high output Sunny Tripower CORE1 outdoor inverter with 50 kW is quick and easy to install with just a few components. The device boasts six MPP trackers, Wi-Fi communication and various other functionalities for an attractive price. It is suitable for large rooftop installations, as well as free-standing installations. - SolarEdge Technologies (Israel): The enhanced S-Series Power Optimizer for PV modules is more efficient and 60% smaller than its predecessor. It is equipped with a temperature sensor for monitoring, a module connector and an emergency shutdown functionality. This improves the safety of a PV installation for the same price as the previous model. - Solaria Corporation (USA): The Solaria PowerXT™ 330 is a high-performance module with 330 Wp and a module efficiency of up to 19.3%. The module consists of overlaid monocrystalline standard solar cells for a more efficient use of space. The modules are manufactured with black backsheet and frames, giving them a striking appearance. The Intersolar AWARD is presented by the organizers of Intersolar in cooperation with a top-class panel of judges. Products, projects, services or solutions may be submitted by exhibitors from any of the international Intersolar and ees exhibitions taking place in 2017. Submissions must have been presented for the first time at one of the above exhibitions, or have to be refinements of previously presented products and services. Submissions were invited in the categories Photovoltaics and Outstanding Solar Projects as well as (for the first time this year) for the new topic of Smart Renewable Energy in the category of Outstanding Solar Projects. Intersolar Europe 2017 will take place from May 31–June 2 at Messe München. With events spanning four continents, Intersolar is the world’s leading exhibition series for the solar industry and its partners. It brings together people and companies from around the world with the aim of increasing the share of solar power in our energy supply. The exhibition and conference series focuses on the areas of photovoltaics, energy storage systems and renewable heating, as well as on products and solutions for smart renewable energy. Since being founded, Intersolar has become the most important industry platform for manufacturers, suppliers, distributors, service providers and partners in the global solar industry.